The streetwear icon gets sized down for little ones. 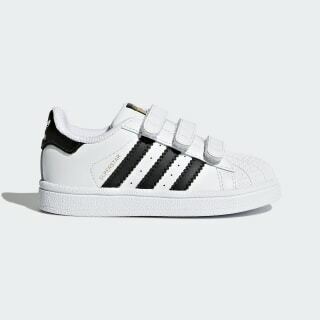 A tiny take on a big style, these infants' shoes scale down the clean lines and effortless style of the famed adidas Superstar. With a leather upper, they feature the classic rubber shell toe and signature 3-Stripes. Hook-and-loop straps allow for easy on and off.